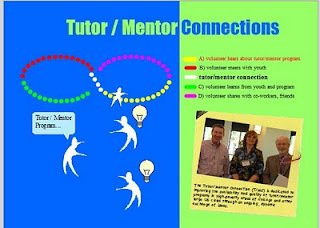 The Tutor/Mentor Connection (T/MC) was created in 1993 as part of a 501-c-3 non profit that also operated a single tutor/mentor program in Chicago, and operated under that structure until 2011. In mid 2011 the Tutor/Mentor Institute, LLC was created to continue to support the T/MC in Chicago after the strategy was discontinued in the original non profit organization. While it continues to focus on Chicago the Tutor/Mentor Institute, LLC also seeks to support other intermediary groups supporting citywide efforts in other states and countries. While not a non profit, the Tutor/Mentor Institute, LLC has all the same goals as we've had since 1993 and the same lack of financial support to do this work. We continue to depend on volunteers to help it do this work. This concept map illustrates the range of talent needed to support the work we're doing. It's also a pretty good map of talent needed by every other non profit youth organization. Below is a list of the types of volunteer opportunities that are available. Most can be done working from remote locations. Web Researcher and Links Manager —Collect and maintain the information and links on the T/MC Web site. Volunteers search the internet for new links, check existing links and organize online discussions to help people find and use this information. Here are links to some articles about the Tutor/Mentor Connection. Help us increase the number of people who visit this web site and use this information, and you play a valuable role in helping us connect inner city kids in long-term volunteer-based programs. Communications—Prepare publications, brochures and other media used to connect youths, volunteers, parents, donors and other stakeholders with each other and the tutor/mentor community. Volunteer roles can be ongoing or project-based. Time commitment varies. Net-Worker—Actively spread the word about tutoring/mentoring to others through church sermons, Web site links, email, letters, or word-of-mouth. This is the easiest and possibly most important role anyone can take. Just by encouraging someone to visit this Web site you enlarge the army of tutors/mentors and resource builders in Chicago. Time commitment varies. Blogger—Write about tutoring and mentoring in blogs and forums. Time commitment varies. Visualization Project - Visit this page to view projects created by interns to interpret and share T/MC strategies with a wider network of people. Youth and adults, working in schools, non profits and businesses can create these visualizations and communicate them to a wider range of people. Fund raising—Help raise funds to tutor/mentor programs in Chicago or your own community. Become a champion of tutoring/mentoring in your company, church or civic organization. Help organize fundraising events, write grant proposals and recruit a network of potential donors. Help recruit sponsors to support events and activities of the Tutor/Mentor Institute, LLC. Planning Wiki—This wiki outlines the strategies and projects that have been created since 1993 and continue to require maintainence, update and improvement. It also includes a list of other ideas that support efforts to make tutor/mentor programs available in more places. These are projects that others could take a role in bringing to reality. The wiki needs editors who will update the content, and recruiters who will help find people/partners to do the work described in the wiki. Database and Information Management (described in planing wiki)—Develop and maintain interactive databases used to collect and share information. Volunteers should have extensive experience in database design. GIS Mapping and Training (described in planning wiki)—Update and expand the GIS mapping capacity of T/MC and create a youth apprentice program that teaches teens to create map views and Web pages that show where tutor/mentor programs are needed and where they are located. This is a career development activity. Contact us if you're interested in volunteering. Volunteers can serve more than one role and can also be one-on-one tutor/mentors if they wish. This graphic is from an animated presentation created by an intern working with the Tutor/Mentor Connection. See this and similar work at this site. Volunteers from colleges, high schools and/or business could be doing projects like this. If you'd like to know more email tutormentor 2 at earthlink dot net.